I teach art history and art appreciation in the Department of Art and Design at Morehead State University in eastern Kentucky. Most of my students are first-generation college students, and many of them come from the economically-depressed counties within a short driving distance of my institution. Through in-class discussion and office hour chats, I have learned that many of my students feel strong ties to an Appalachian identity. 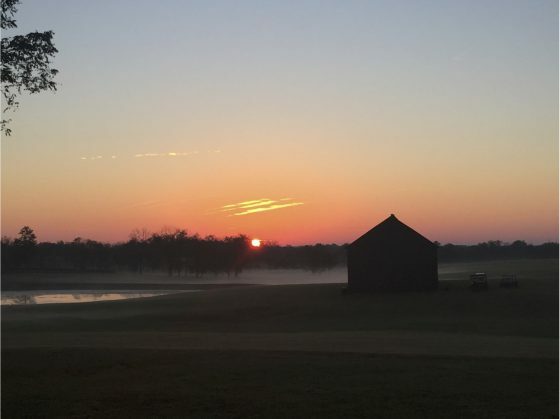 Some struggle to maintain a connection to home, the mountains, and deep family bonds and traditions while fighting against stereotypical representations of the region and the very real problems eastern Kentuckians face: poverty, poor health, addiction, and unemployment. Others embrace terms like redneck and hillbilly and celebrate the lawlessness of an Appalachian past that includes moonshining and deadly family feuds. In 2016, Appalachia acquired another identity during the Presidential campaign: Trump Country. Men and women desperate for change and a return of coal mining jobs that left the region beginning in the 1980s were some of Trump’s strongest supporters. From the New York Times to Fox News, journalists rushed to the region, attempting to characterize its citizens while explaining their plight to urban America. I wondered how my students felt about this. Was anyone getting it right? In the tense political climate of fall 2016, I decided to take a photography assignment which I had first offered the previous semester as extra credit, and make it a required assignment for all students in ART 160: Understanding the Visual Arts. 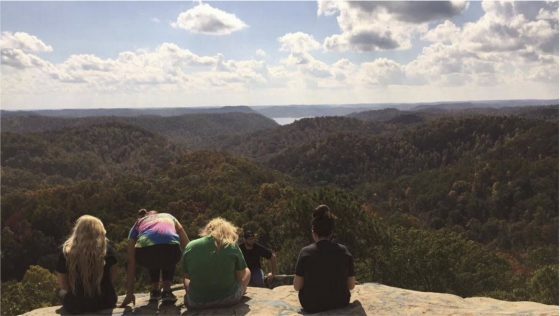 I called the assignment “The ‘Kentucky is…’ Hashtag Challenge” and asked students to visually document an aspect of their own Appalachian identity or respond to a stereotype of the region. I am sharing this approach in the hopes that other instructors of art history or art appreciation can tailor it for urban and rural locations to give their students the opportunity to explore issues of regional identity within the realm of visual culture. Understanding the Visual Arts is an art appreciation course that also fulfills a General Education requirement in the humanities. It is overwhelmingly populated by freshmen, most of them non-majors, and I teach two sections every semester. Although it is not a studio course, I have created assignments that encourage students to explore materiality and art making—for example, students might be asked to turn in sketches or found sculptural objects for an assignment. Near the midterm, we have a unit on photography, which usually covers four 50-minute class periods. Students enjoy this unit, in part I think because of the connection they feel to the photographed image. They are consumers and producers of images at a rate previous generations of photographers could not have imagined. We begin with a discussion of the history of photography and the evolution of photographic techniques and processes; then, I shift focus towards photography as social commentary. We look at the work of Dorothea Lange, Walker Evans, and other WPA photographers. We consider the documentary nature of photographs as social history with the photographs of Charles “Teenie” Harris, depicting life in the Black neighborhoods of Pittsburgh from 1936 to 1975 (nearly 60,000 images are available to the public through Carnegie Museum of Art’s online collection). We then consider photography and identity through the high art photographs of Cindy Sherman and the recovered negatives of self-taught photographer Vivian Maier. Finally, we shift our focus to Appalachia. Students watch and critique the 2003 documentary The True Meaning of Pictures, which features the controversial photographer Shelby Lee Adams. Born in Hazard, a town in southeastern Kentucky, Adams’ stark black-and-white photographs depict, as he describes them, the “holler dwellers” and “mountain people” of Appalachia: impoverished, uneducated, extended families living in primitive conditions in remote areas of the mountains. His photographs are visually gripping, with chiaroscuro lighting effects and wide angles provided by a large format 4×5 camera mounted on a tripod. Filmmaker Jennifer Baichwal interviews Adams and his subjects, most of whom are pleased with his depiction of their lives, as well as his critics, who believe his work perpetuates stereotypes of inbreeding, shiftlessness, and religious fanaticism. As they watch the documentary, I challenge my students to consider whether Adams is exploiting his subjects’ poverty or celebrating their strong family ties in the face of great adversity. They consider whether his work is documentary in nature, or if his interventions constitute something more like fine art photography. One of Adams’ photographs from the 1990s, for example, depicts the Napier family posed around the carcass of a hog that has just been slaughtered and butchered. Adams posed the entire shot, even purchasing the pig for the family since they could not afford one. Is the result a documentary photograph which aims to capture a dying mountain tradition, or an event staged by Adams for the purpose of a well-crafted, visually dramatic composition? After the documentary, we discuss how visual culture, especially photography, has the ability to propagate or dismiss traditional stereotypes of the region. Choose from two or more of the following hashtags and create a picture that encompasses your understanding of this region and/or explores a stereotype of Kentucky, Appalachia, country life, etc. You can choose a stereotype that is negative, or a commonly held positive stereotype, or you can choose to create an image that is in direct contrast with a stereotype. If you would like to create other hashtags, you are welcome too! Some ideas to get you started are: #countrylife #bluegrass #hillbilly #kentuckyproud #myoldkentuckyhome. Next, caption your photo “Kentucky is ……..” and fill in the blank. Upload your photo, type your caption into the field, and I’ll create an “Instagram feed” for us to discuss in class. You must produce an original image; it cannot be another artist’s photograph. 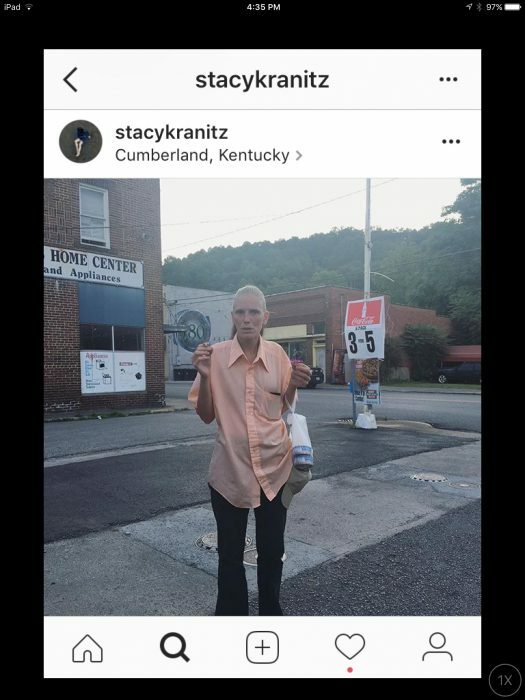 A post from photographer Stacy Kranitz’s public Instagram feed. Overall, students enjoyed the opportunity to create a work of art rather than simply write about one, and all students were able to create a digital image—most of them simply used their phones. Photographs included images of sunsets over the mountains, hills, and rolling farmlands of central and eastern Kentucky, a group friends at the top of Lockegee Rock after a hike, a family picnic. One student cheekily challenged the stereotype of teenage pregnancy with an image of her closet full of shoes (“No, I’m not #barefootandpregnant in Kentucky”). Another student challenged the #shiftless stereotype with an image of his barracks while on National Guard duty. I received one image of a Confederate flag with the hashtag #southernstrong and spoke individually with the student about his interpretation of this symbol compared to the history of hate that it still represents for others, a reminder that racism is a part of this region’s past as well as its present. To close the assignment, and the photography unit, I randomly compiled the images into a PowerPoint slide show, and gave students the opportunity to speak about their own image if they chose, or to ask questions about someone else’s image. Most students simply sat quietly and watched a stream of beautiful images and moments from eastern Kentucky go by. It was a welcome respite from the all-consuming political theater of the 2016 election cycle, as well as a thoughtful intervention. Their emphasis was overwhelmingly on Appalachia’s natural beauty and the family and friendship bonds that helped to define their personal identities and speak so strongly to the culture of the region. I have offered to provide alternatives for students who do not have digital cameras; so far, I haven’t encountered any!